Omnia Gallia est divisa in partes tres... Belgae sunt fortissimi omnium horum. (Those of a certain age will remember.) 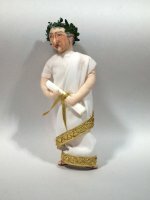 The cause of it all, in white toga with gold trim, the laurel wreath of office upon his head.